Crocheting wrist warmers is a fun project that produces a practical item. 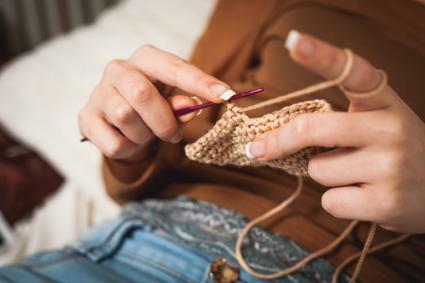 Crocheting, like knitting or sewing, can provide a great creative outlet and a way to work with your hands to produce durable goods. 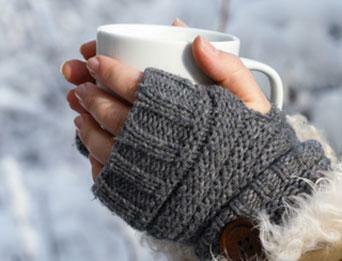 Wrist warmers can be a practical and stylish accessory for the winter months. Wrist warmers are garments that cover the wrists and usually stop halfway up the hand in order to allow your fingers to move around freely. These are excellent for keeping your hands warm in cold environments without risking losing your grip on the steering wheel while driving in the car or dropping your food while dining outdoors. 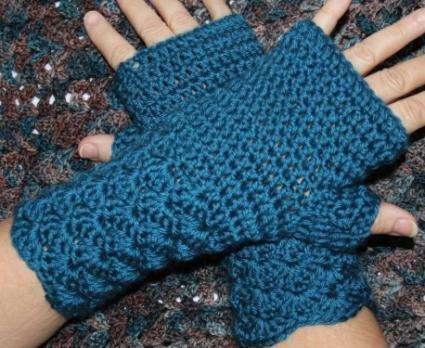 Wrist warmers can be made of a variety of materials in any color or style. Fabric wrist warmers, suede or leather wrist warmers and wool wrist warmers can all be purchased. When crocheting wrist warmers, you will need to choose a high quality yarn to serve as the base for your stylish accessory. The yarn is very important when preparing to crochet anything, especially wrist warmers since the quality and thickness of the yarn determine how warm your wrist warmer will be. Choose a high quality yarn that feels soft and that won't be itchy on your wrists. Color is also a factor when selecting yarn. Some people choose to crochet wrist warmers in one single color, while other people look to add a little interest to the project and crochet two or more different colors or even patterns into the project. Think about what you want your wrist warmers to look like. Imagine the colors or patterns, but also factor in whether you are skilled enough at crocheting to blend the patterns and different yarns. It is usually best to plan on purchasing more yarn than you actually need so you are prepared for any mishaps or mistakes that may necessitate throwing away a section of yarn. While you are at the store, remember to purchase a size J crochet hook along with a sewing needle and scissors as these are musts for the process. To make a wrist warmer, the basic stitches that you will be using include the single crochet and the double crochet. Many beginners try to learn these stitches through reading an instruction booklet. An illustrated guide is often your best bet to learn these basic stitches so you can have a visual representation of what you need to do. You can also check out the LoveToKnow Crafts guide to Crochet Stitches. Using these basic stitches, you need to create rows of chains with roughly 24 links in each chain. Crochet one chain row and put it around your wrist to make sure that the wrist warmer will fit properly. Once you get to the end of the first row and have sized it to your wrist, turn and move back using the same technique. Single crochet the back bumps of the stitches in order to create a more finished edge. Usually, 11 rows are enough to complete a solid rectangle. Take your scissors and cut the yarn, leaving enough so you can sew the ends of the wrist warmer together later. Once the rectangle is complete, bring both of the long sides of the rectangle together and sew them together with a needle. Crochet stitch about one inch of cloth to sew onto the side of the wrist warmers for your thumb. The rectangle is left open for the hand to go through. If you have problems, make sure to check your stitching. At the end of your project, you will have one wrist warmer. Of course, since you have two hands, you'll need to make another. As you do your original project, write down how many rows you made so you can duplicate the process for the other hand. This is especially important if you used multiple colors so you can switch your yarn colors in the second warmer in the same place so both hands will match. When you are done crocheting wrist warmers, you will have a stylish and practical accessory you made with your own two hands.